A breakthrough non-surgical and non-invasive technology for the treatment of lower back pain and sciatic pain is available in the Chattanooga TN area. This technology is known as Spinal Decompression. True Wellness Chiropractic has some of the first doctors in Tennessee to use this state of the art technology. This treatment can provide relief for those suffering from back pain due to herniated or degenerative discs, joint problems, arthritis and sciatica. This treatment is not surgical at all and does not require any prescriptions that can cause side effects. 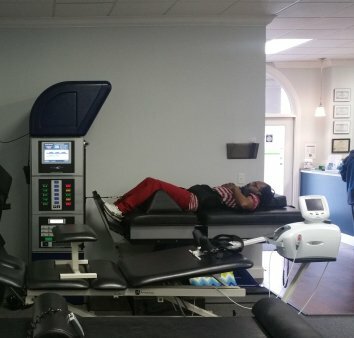 Rather, during a spinal decompression treatment, you will lie on your back on a table. This table is the DSX9000 compression machine and it will act to lengthen and stretch your spine. Many patients feel pain relief within a few minutes of treatment. It is so comfortable that most patients fall asleep during the 30-minute session. A clinical study has shown that 86% of patients treated with this new technology were effectively corrected. Spinal decompression therapy has been able to help many who have had unsuccessful back surgeries. The treatment is geared towards the patient’s specific condition and medical history. True Wellness Chiropractic can provide new patients with a free exam to see if this amazing treatment can assist you with your pain and discomfort.